A specialist Utility to help you manage Call Lists for GoldMine 5.x, GoldMine 6.x, GoldMine BCM Standard Edition, GoldMine Sales and Marketing and GoldMine BCM Corporate Edition. Can be used to consolidate call lists and balance work loads between agents. Specify Activity Code and/or Call Reference Filter to move only a selected type of call from one agent to another or from a master list to each agent. Integrated Utilities to help manage your GoldMine Installation. When managing multiple telemarketing campaigns with agents that have different skill sets, the ability to manipulate call lists between agents is fundamental to the efficiency of the team. Call Reallocator allows telemarketing managers to move calls between agents to balance workloads, to draw down calls from a master pool of calls and to allocate a specific number of calls of a certain type. 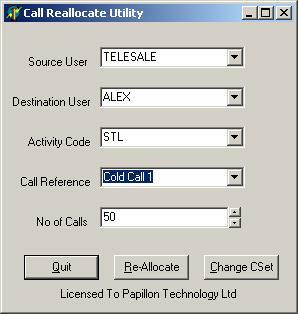 To download the Call Reallocator for GoldMine 5.x click here. To download the Call Reallocator for GoldMine 6.x click here. Call Reallocator will help you control and manage your agent call lists. Call Reallocator allows you to maintain consistent flow through campaign call lists. Call Reallocator allows you to return uncompleted campaign calls in an agent's call list back to the master pool of calls (to be reallocated to an agent at a later date).